Welcome to the home page for the classic yacht, Coronet. 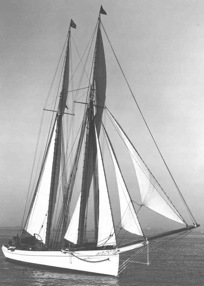 Coronet was first launched in 1885, and was one of the most elegant sailing yachts of her day. She was designed for crossing the ocean in style, and featured a marble staircase, stained glass doors, mahogany paneled staterooms, and a piano in the main salon. Since 1995, Coronet has been on the campus of the International Yacht Restoration School, awaiting restoration. Coronet Restoration Partners purchased her in 2006, and restoration has now begun in earnest. We’ll be following Coronet’s team of shipwrights here as they bring this classic boat back to her former glory. We’ll cover it all, from harvesting the timber to restoring the original interior. If you are a builder, a hobbyist, a historian, or just enamored with classic boats, we think you’ll enjoy watching this beautiful vessel come back to life. If you see this (more…) at the bottom of a post, that means that the post continues on another page. Just click it and you’ll go to the rest of the post. Unfortunately I don’t have info to share on why the project is currently paused. That’s between the owner and project manager. In the meantime, you can create a Google alert that will send you a message when this website is updated, and save you the trouble of continually checking in. In the box where it asks for a topic, enter Coronet1885. That should keep the alerts pretty much focused on just this site. Hi, I stopped by yesterday to check on progress and was sad to see it at a standstill. But it was as wonderful as ever to explore and I took some photos of all the bits and pieces around (My favorite part). Thought I’d share. Fingers crossed for work to start up again. Thank you for sharing your photos! You’re not alone in hoping that the project gets going soon! Well, its been a while since I discovered the Coronet’s history on TV. As I recall, I saw the re-launching, which was, as I say, kind of scary; since the Coronet almost capsized! As a visual lover of things old, glorious or beautiful, please keep my email and send me a note when and if the restoration is restored. Must say – despite what the delays’ causes are – that the work done before the stop was really remarkable. Great news that there is progress! After two years I feared that the project had come to an end. Thanks Tom for keeping us updated.